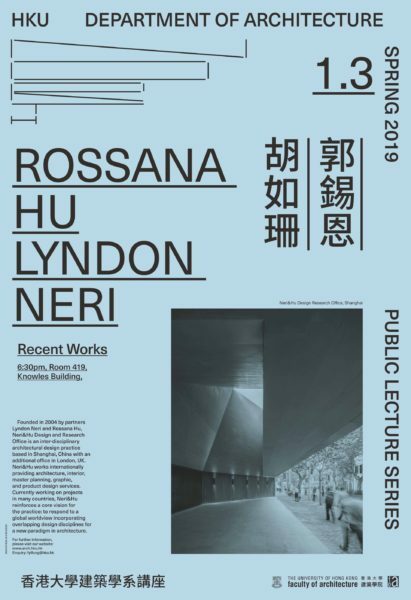 The Fall 2018 Public Lecture Series of HKU Architecture with a roster of events highlighting the theme “Agendas for the South”. 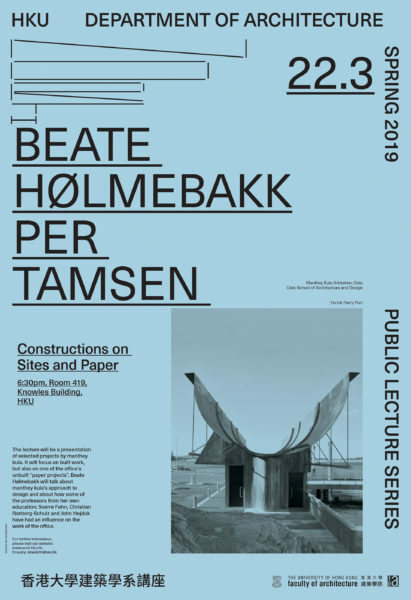 Through the register of building and discursive positioning of the invited architects, the lectures present particular readings of the programs for architecture and the concept of the South, taking into account the nuanced and diverse sociocultural, geographical, and political contexts. He Jianxiang 何健翔 and Jiang Ying 蔣瀅 of O-Office from Guangzhou will begin our lecture series on Friday, September 28, with a talk on working “In PRD“. 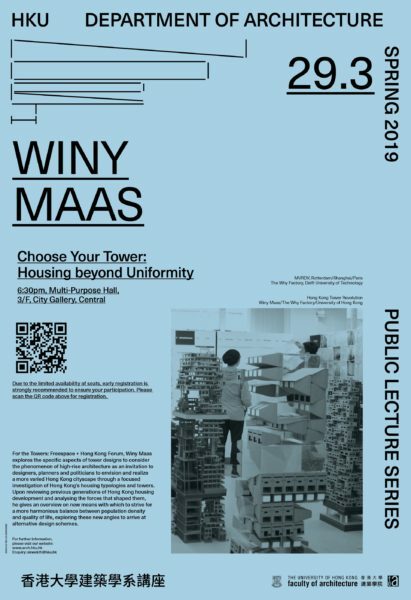 Gediminas Urbonas, Director of MIT Program in Art, Culture and Technology, will visit on October 5 for a lecture on “Swamps and the New Imagination“. 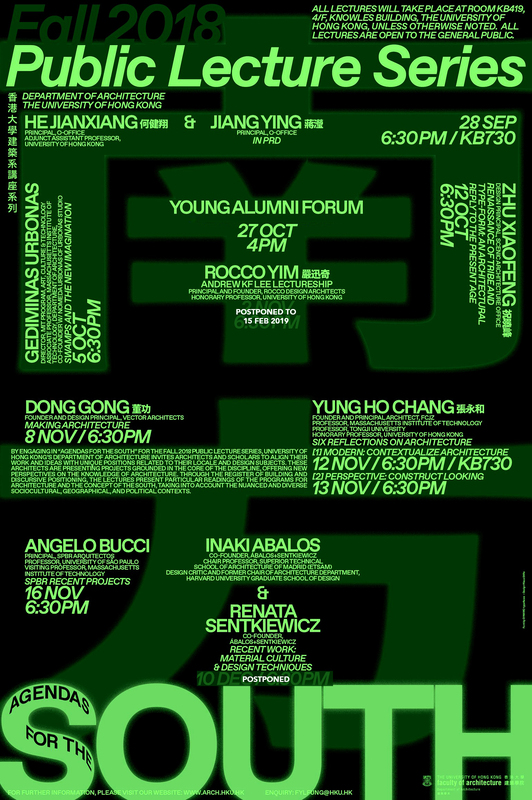 Young Alumni Forum I: By inviting emerging architects graduated from HKU Architecture to share their practice with us on Saturday, October 27, we will launch our first Young Alumni Forum joined by our faculty and alumni. 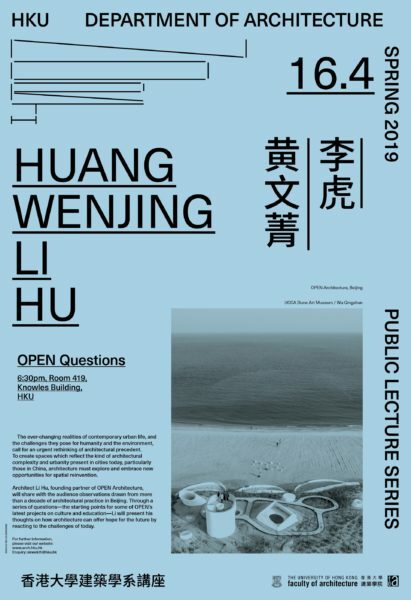 Dong Gong 董功 of Vector Architects from Beijing will visit HKU on November 8, to discuss current projects and their recent contribution to the Venice Biennale. 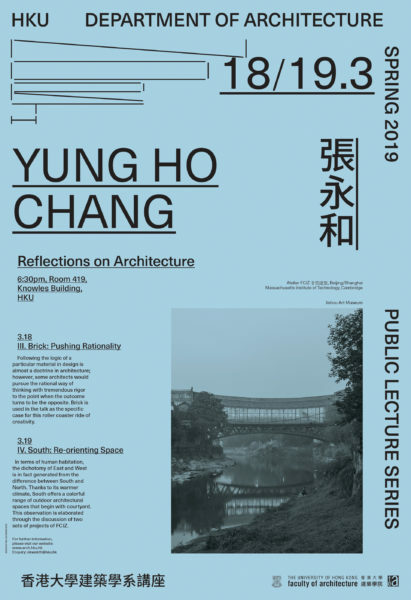 Yung Ho Chang 張永和 of FCJZ and former Chair of Architecture at MIT, will launch the series of “Six Reflections on Architecture” with HKU Architecture. 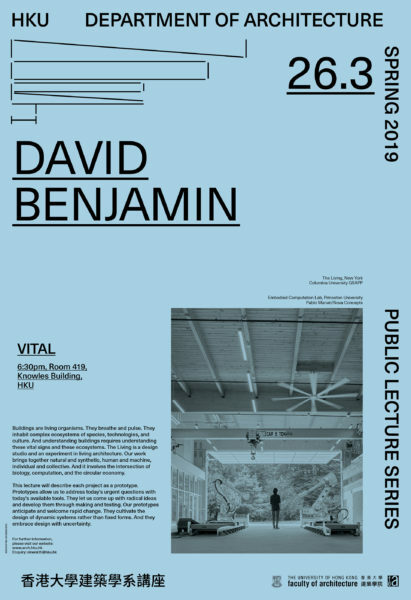 His first two discussions on “Modern” and “Perspective” will be held on the evening of November 12 and November 13. 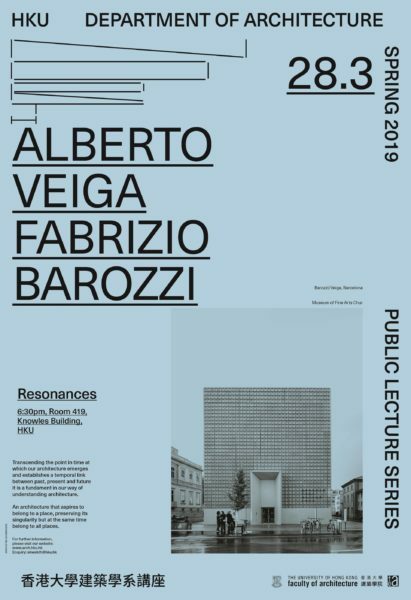 Angelo Bucci of SPBR in Sao Paulo will deliver a lecture on his work, including his recent publication with GA Document, on Friday, November 16. 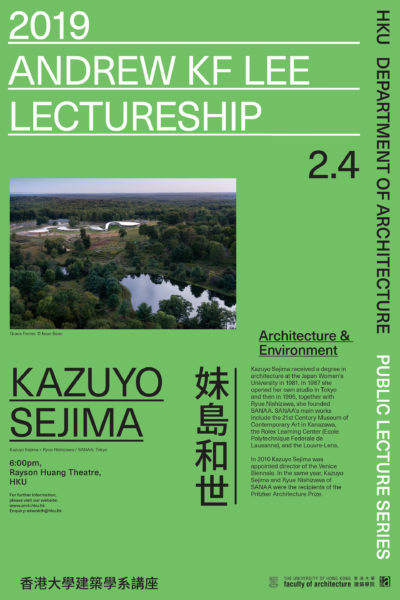 He will also be lecturing in our Shanghai Study Centre on Monday, November 20. 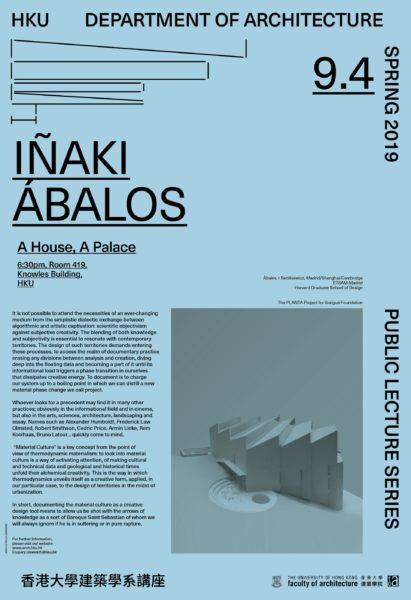 Iñaki Ábalos and Renata Sentkiewicz of Ábalos+Sentkiewicz, Chair Professor at ETSAM, Design Critic and former Architecture Chair of Harvard Graduate School of Design, will discuss their recent work on December 10, focusing on “Material Culture and Design Techniques“. 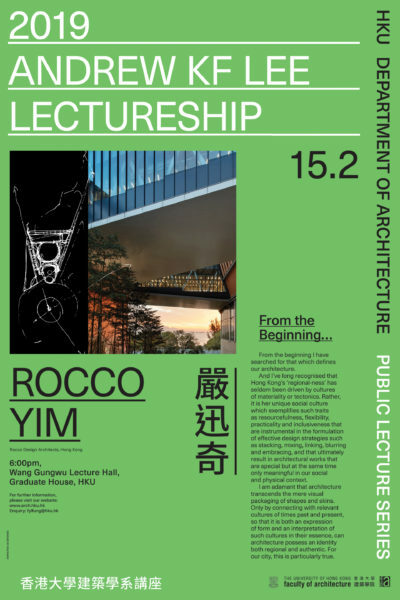 Rocco Yim 嚴迅奇 of Rocco Design Architects, alumni and one of the most internationally renown architect from HK will deliver his public lecture in HKU on 15 February, 2019, as the first speaker for the newly established Andrew KF Lee Lectureship.